Since we have changed email providers, it's a good time to take a look at what you are including in your email signature. In Gmail, it is much easier to include social media icons. Your email signature should include the ways you want people to contact or communicate with you. I chose to include Twitter, Pinterest and Blogger. You could also include Facebook, LinkedIn, an icon that links to your web site, or any other web resource. Most of you will also include your phone number. I don't because I'm rarely near my work phone. Note: Keep it simple. Don't include a resource you don't check or update regularly. Search for a social media icon. I'm going to use Twitter as an example. Type "twitter" in the search bar. On the left side of the screen, change the PRICE to FREE. Change the ICON SIZE to 0 to 32. Choose your favorite version of the icon. GCISD now has a new royalty free sound site for teachers and students to use. The link has been added to GCISD Important websites. At this time, only Volume 4 has been purchased. 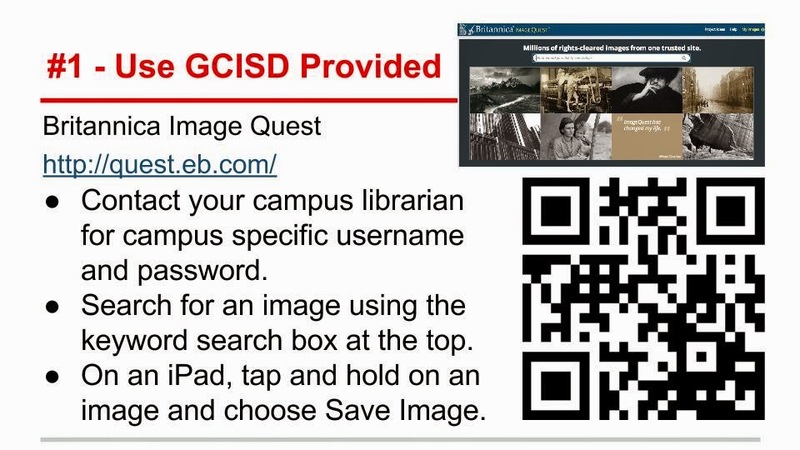 When going to the SoundzAbound site, you will already be logged in with the GCISD login. No need to log in! Note: This can only be used inside the district. It cannot be used at a location outside GCISD. Today's guest post comes from Erin Gerdes, 2nd grade teacher at Silver Lake Elementary. You can follow Erin on Twitter @ErinGerdesSLE or on her blog http://gerdesstars.blogspot.com/. BatchGEO takes a spreadsheet and marks the locations you list. (Tammy suggests creating a Google Form to collect the data from students then using the Google Spreadsheet to transfer the information to BatchGEO).